When I was thinking of themes for these new years eve invitations the one image that kept coming to mind over and over was the ball dropping at central square. What a simple and elegant theme for an invitation. 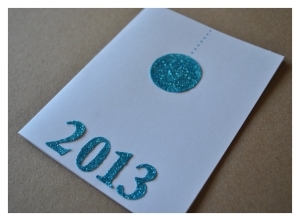 This invitation can be paired with a casual family and friends party, to a ritzy new years eve gala. I used simple die cut and paper punched pieces coated in glitter and gloss medium to accent this invite. These invitations are pretty simple to make. These are the sort of "less is more" scenario to invitation making. You can make things even more simple by adjusting the materials you use to make them, as well. I will start by telling you how I made them, and then give some pointers on how you can modify things just a bit to make them even more simple to create. I started by making my own cards using 110 lb. cardstock. I created a template with the small dots you see at the top of the invite (kind of "suspending" the ball from the top of the card) which is free to download for your personal use. If you want to print some wording onto the inside of the card I also have free downloadable templates for that here on the printable invitations templates page. To create the base of this invitation I printed the template onto 110 lb> plain white cardstock, which I then cut in half to create two invites per single sheet. I then used a bone folder to score and fold the two paper halves, to create two folded cards. Once the cards were created all I had to do was add the decorative accents to the front of the card and they will be finished. I used a 1 1/4" round paper punch to create the "ball". I punched the circle out of bright blue cardstock. To create the numbers to place the "new year" onto the front of these New Years Eve Invitations, I used my Cricut die cutting machine. Don't worry, there are several other ways to create these numbers which I will share below. 1. punch the shapes from colored cardstock. 2. cover the cardstock in glue with a paint brush or q-tip. 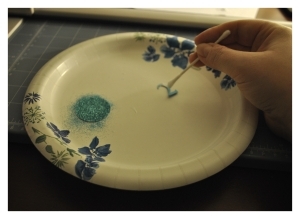 3. cover the shapes in colored glitter. 4. tap off the excess glitter. 5. apply gloss medium such as Inkessentials glossy accents. I used some good craft glue to attach the decorative pieces to the front of the invitations and that was it! My absolute fave glue to use for this kind of project is Scotch Quick Dry Adhesive with the precision tip. You have to work quick with it but it has really great hold and is very light. I created the numbers for the front of the invitations using a Cricut Die cutting machine, but realize that not everyone has this kind of machine readily available. Soooo, I wanted to share some other ways to get the same look using other tools and supplies. Some are even easier than what is already outlined above! Paper punches - Yes there are number and letter paper punch sets out there. Simply punch the numerals out of a coordinating colored cardstock. Other Die Cutting systems - There are less involved and more affordable die cutting systems such as the Cuttlebug, Sizzix, or spellbinders. You can buy a hand cranked machine and die cut plates to use in conjunction. Die Cut Paper - sometimes you can buy pre-cut shapes and decorate the yourself. If you can come across these they are a time saver for sure. Stickers - these days there are a TON of different kinds of stickers out there, mainly used for scrapbook and cardmaking. At most any craft store there will be entire aisles dedicate to stickers. Good Olaf glitter and glue - you can always simple write the new years date using craft glue and shake some glitter onto it. tap off the excess and viola! Pre-printed date - I also have provided a customizeable template with a spot to enter the date/year in case you want to go the easiest route possible!